Lyman T. Johnson | Photo Courtesy of ExploreUK. LEXINGTON, Ky. (Feb. 4, 2019) — One man. Seventy years of a journey that is still unfolding and evolving. That is the story that UKNOW will tell this month — across multiple platforms — as part of Black History Month. It is the story of an institution, intentionally striving to be a community of belonging, even while acknowledging that its evolution has not been a straight line of progress. It has been one of paths forged, triumphs and trials, opportunity and obstacle. The journey began with one man, who took one step. 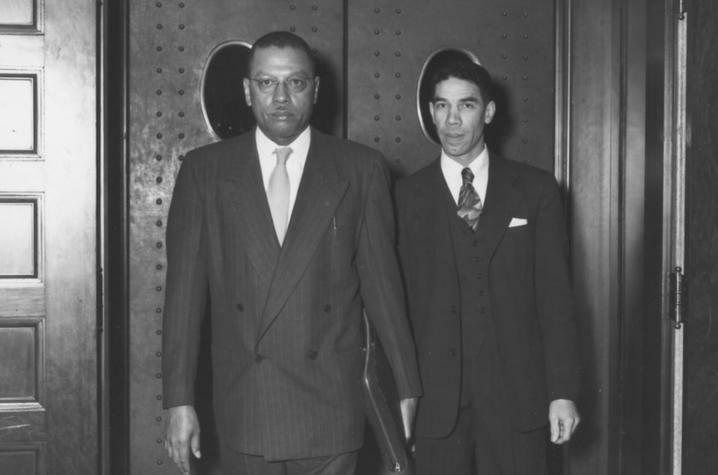 In 1949, five years before the Supreme Court declared that “separate but equal” was anything but, Lyman T. Johnson became the first African-American man to enroll at the University of Kentucky. It was, by all accounts, a wrenching path. But 30 years later, Johnson was one of four men awarded an honorary doctorate from UK. Today, awards, ceremonies, programs and a residence hall proudly bear his name on the UK campus. And now, that seven-decade journey — from court-ordered integration to a university that strives to be a community of belonging for everyone — is the subject of a yearlong examination. Celebrating 70 years of integration will feature a series of events, academic courses and special presentations throughout the 2019-2020 academic year. The celebration and examination are sponsored by UK’s Office for Institutional Diversity, which itself is celebrating its 10-year anniversary this academic year. Colleges and units from across the campus will be involved, and a detailed calendar of events will be unveiled in the coming months. "We will continue to look to those who came before us to ensure we honor their legacies and learn from their journeys,” said UK President Eli Capilouto. “That is what it means to be part of this community. That is what it means to envision a better future for Kentucky." To kick off that examination, UKNOW will feature a special series of stories focused on Building Belonging. These stories depict the people who represent and symbolize UK’s journey. “With courage and dogged determination, (Lyman T. Johnson) opened this heavy door and inscribed in our history a profound idea: the bold but graceful declaration that anyone — regardless of who they are, the color of their skin, what they believe, how they identify themselves, or where they are from — can find a place at the University of Kentucky,” said Sonja Feist-Price, UK’s vice president for institutional diversity. The founding leaders of the Black Student Union and their push for change to UK’s leading role in the Southeastern Conference in integrating major sports. The UK student leader in the 1980s who never felt he could be his true self, but more than a quarter century later came back to campus to endow a central gather space in the LGBTQ* Resources Center, located in the heart of the campus at the Gatton Student Center. UK’s 10th Rhodes Scholar who recently led the push to endow a scholarship, based on the idea of helping underrepresented students afford a college education and also bridging divides between the Muslim community and others. A discussion by current students of color regarding the issues they continue to face on campus. In total, UK’s journey — like that of Lyman T. Johnson 70 years ago — is one of forward progress in the face of continued challenges. Its history is shaped by stories of transformation and depictions of halting, hard-earned efforts that took years to find success. It is, of course, a journey on which our institution remains firmly fixed.